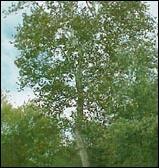 This tree in Colorado American sycamore is a large, attractive tree that is not very common in most Colorado communities. It is common in southeastern and far western Colorado. The bark becomes a mottled brown and tan which is its main attractiveness. 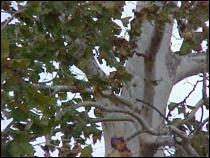 London planetree (Platanus x acerifolia) is a cross between American and oriental sycamore that grows well in Colorado. 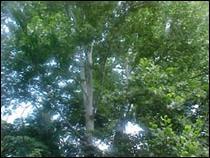 It has the same characteristics as American sycamore. Its fruit has two rounded achenes. Hardiness Zones 4 to 7. Mostly common to the eastern part of United States. It is not native to Colorado. Growth rate Medium to fast growth rate in areas with irrigation. Growth habit As a young tree, it forms a single main stem. As it ages, the crown becomes large and wide spreading. The truck gets very large. Often pyramidal shape. 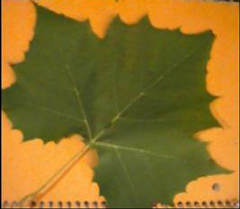 Foliage Alternate; simple; 3”-8” wide; deciduous; deeply lobed; leaf looks very much like a maple leaf; bright green and glabrous above; paler and hairy below. Remember, maple leaves are oppositely aligned on the twig where sycamore is alternately aligned. Fruit Single, round headed ball or achene. Mostly one per stalk, as compared to London planetree that normally has two per stalk. Bark Brown on younger branches; soon becomes mottled (brown and creamy white) as the brown bark peels off; showing the creamy-white smooth inner bark; very distinctive bark. Twigs Twigs are moderately slender; orange-brown; zigzag. Insects and diseases Antracnose is the main disease that affects the leaves. It causes leaves to drop early. Leaves appear to be scorched in an irregular fashion. Landscape value This tree can be very large. It is not recommended as a street tree unless the tree lawn is wider than 6 feet. It is best to plant sycamores in areas where there is considerable room. The fruit, twigs and leaves can be messy. The tree’s bark is unique and adds a nice change to the more common trees found growing in our area. The hybrid, London planetree, is more commonly planted as a street or park tree.